Since 1994 I’ve had the pleasure of contributing to KUOW’s Weekday while on the road via commentaries and interviews. For our latest trip, I sent in 24 sound clips that aired on the shows “sound of the day” segment. Here are clips 5-8. Travel is all about experiencing new people, landscapes, sights and sounds. Travel can throw you a curve ball. 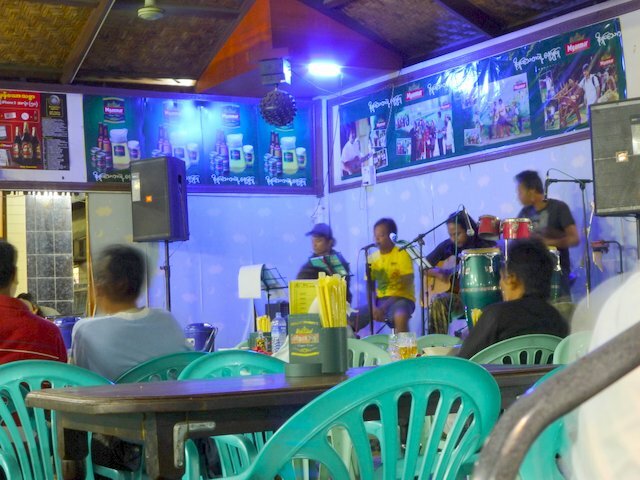 On our first night in Mandalay we went out to eat at this roadside beer hall/restaurant. A band was warming up, and from what I was hearing, I expected to hear local music of Mandalay .. of Myanmar. The first tune the band played … Billy Idol’s White Wedding. How can you not love that? 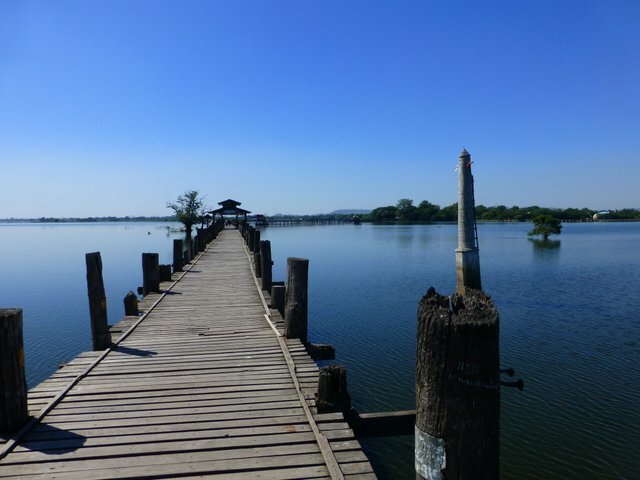 We pedaled across U Bein’s bridge, the world’s longest teak foot bridge. 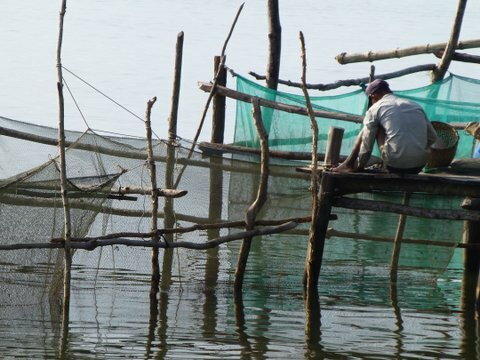 It crosses Taungthaman Lake. Families out for a stroll, young lover’s, monks, school kids, and two foreign cyclists. Lot’s of folks fishing from the bridge, but also women out wading in the lake using a two poll, two hand fishing technique I’ve never seen anywhere else. Lots of loose boards in 1300 yards of span, so that’s what you are hearing as they squeak and chatter as my bike tires roll over them. Don’t be fooled by the train whistle. The other sounds you are hearing aren’t train related. 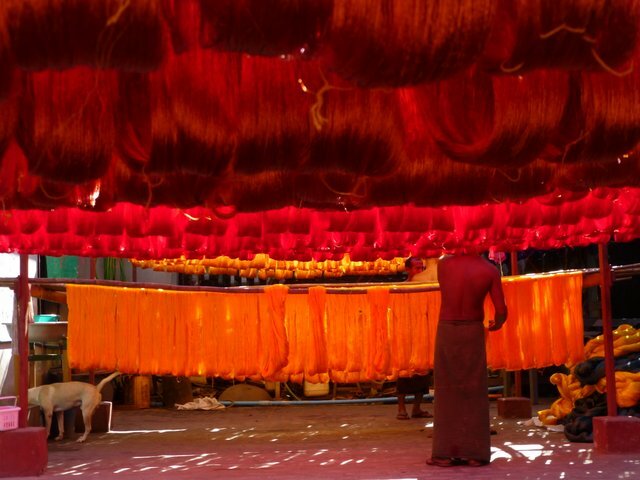 The microphone is in the middle of the street in a small town near Sagaing, Myanmar between two establishments with sets of looms weaving silk. The rhythmic clacking made me feel like I was in the workings of an enormous clock. The train just happened to pass by up on the hill as I recorded. We were walking back to our Happy Hotel (Yes. That’s the name.) and our entrance was blocked by a dancing elephant. Two people in a large elephant costume, actually. 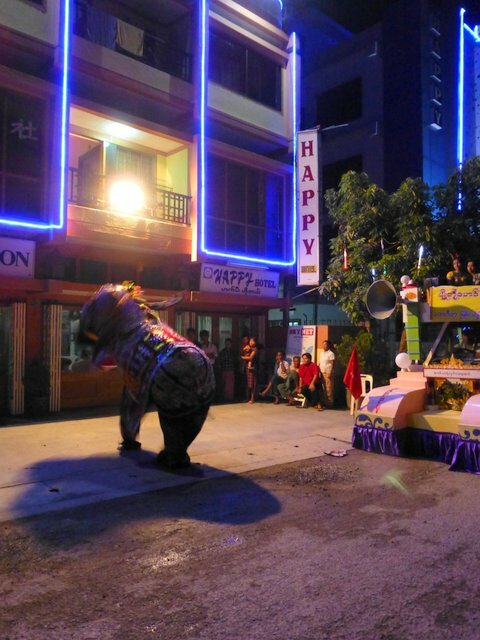 The music was provided by a band in a float truck for the upcoming Full Moon Festival. The live music is then blasted through speakers at a decibel level so loud that KUOW would face fines if they played it at the original volume. Enjoy this much quieter version. Since 1994 I’ve had the pleasure of contributing to KUOW’s Weekday while on the road via commentaries and interviews. For our latest trip, I sent in 24 sound clips that aired on the show’s “sound of the day” segment. Here are clips 1-4. For many a year, it seemed like no matter where we traveled, we would run into a Peruvian band playing in a town or city square. I think the Peruvian band thing has waned in popularity on the international circuit. What’s the new trend? Guys banging on stuff. You’ve seen (and heard) them on the streets of Seattle. A guy sets up a percussion set consisting of common items like plastic paint buckets or garbage cans … and there’s usually a cow bell. Then they wail away on these items, very often with some impressive results. Well, here is the Bangkok version of this new trend. 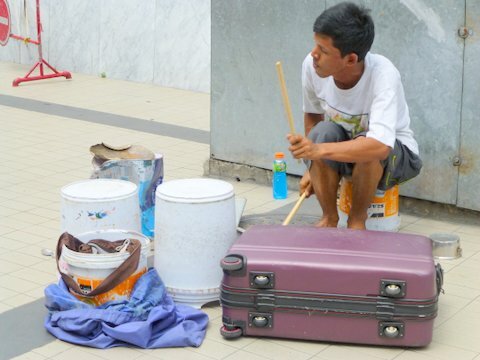 This guy was just outside the National Stadium Skytrain stop. Plastic buckets, pieces of metal, and (one I haven’t seen before) an old Samsonite suitcase. If only he had a Peruvian band backing him up. It’s 11am and it’s hot, humid and around 90 degrees. We are in Lumpini Park, the big central park of Bangkok. A teacher is putting the percussion section of his student band through drills. What you have to imagine to make this sound byte complete, is that every time a kid makes a mistake, they drop down for 2 to 5 pushups. I’ll spare you the long version of this clip. They ran this short section no less than 20 times. 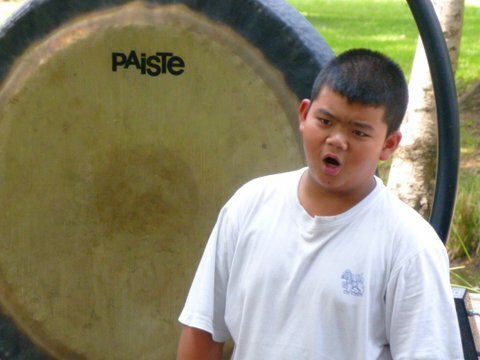 The kid with the gong just couldn’t quite come in at the right time, no matter how many times they ran it. On the positive side, he was getting one heck of a good upper body work out. 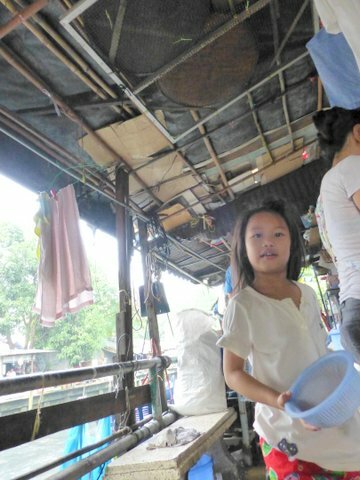 Kat and I wandered along the canal near the Jim Thompson House in Bangkok. Tiny little living spaces packed together in the shadow of huge residential, business and shopping towers. As you walk along the quiet alleys, it’s hard to believe that a massive traffic jam is 500 meters away. Tiny little gardens are planted and tended. Shops the size of a walk in closet offer soft drinks, drinking water and snacks. At first we thought the sound was a video game. Turned out to be a caged mynah bird. 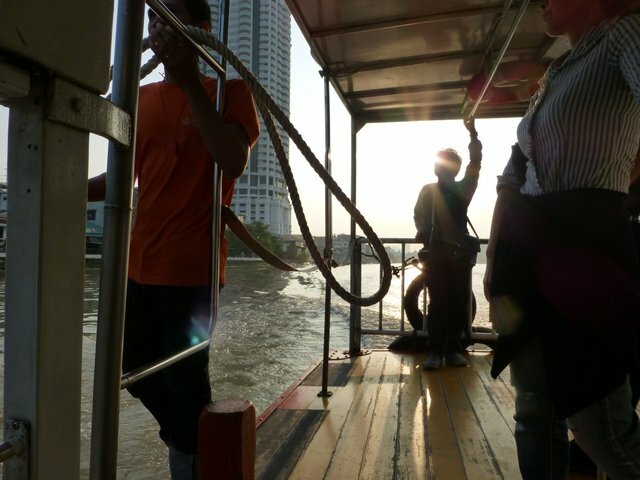 These whistles are familiar to anyone who rides the Chao Phraya Express boat in Bangkok. The pilot of the boat is up front. The passengers embark and disembark from the rear of the boat. A man at the back whistles commands to the pilot. Each whistle has a different meaning, and gives the pilot the information he needs to back the boat up to the dock, when to cut the throttle, when the passengers are clear, and when to speed on to the next stop. 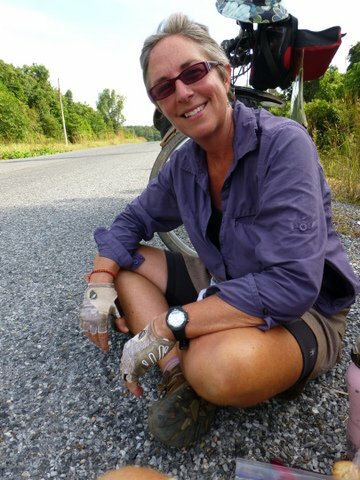 A reader who is heading off soon to bike in Myanmar asked us some questions. So here is some more info to add to our Myanmar Cycling/Travel Tips. In general, are there any routes you really recommend? Or any that we should steer clear of? You won’t be disappointed in getting to both Bagan and Inley Lake. Both are magical places. Make sure you use the advantage of having bikes to get to temples further out in Bagan for sunrise. Worth getting up really early for. We’ve seen reports of folks cycling the main road from Yangon to Mandalay and that is a waste of your precious few travel days in Burma in our opinion. We are also flying from Bangkok to Mandalay. About how much Kyat would you suggest getting when we arrive at the airport? I’m assuming you mostly pay for hotels in U.S cash. I think we exchanged $100 into Kyat at the airport to begin with. You can get a good rate at a bank in any major city or tourist town these days. Gone are the days when the good rate was only available on the black market. So don’t be too worried about running out of Kyat. Best to make sure you arrive with plenty of US dollars in small bills (1’s, 5’s and 10’s), to pay for hotels and entrance fees. Is there any need to bring along a sleeping bag? Many of the areas of Myanmar where you would need a sleeping bag are currently off limits to travelers. If you are traveling the Mandalay-Bagan-Inley Lake loop, you can get by without a sleeping bag. We carry silk liners, which come in handy for dodgy hotels where the sheets look suspect. It sounds like you found a nice place to stay in Kalaw. Do you recall the name of the hotel? It was new and spiffy. Right on the main drag … and not listed in the Lonely Planet. A general rule of thumb is to go the area of any town where Lonely Planet lists hotels and look in the area. Most likely there is a place right next door that is now cleaner and cheaper than a place listed in the LP and it has vacancies. 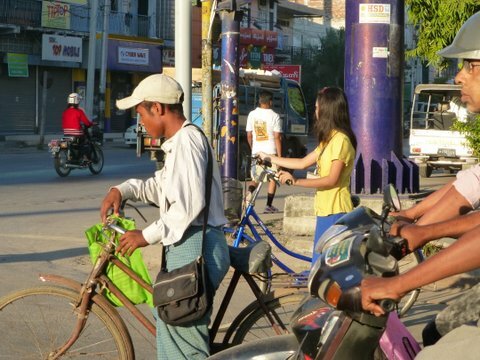 Did you cycle from Mandalay to Monywa in one day? Seems like a big haul. Is there a good hotel in Monywa? We are actually hoping to find a hotel in Sagaing and starting our trip from there. We cycled from Mandalay to Sagaing. Then to Schwebo. Then down and over to Monywa. Great road that crosses over to Monywa. The first part is really bad. Then it’s just bad. But that’s good. Much less traffic. There are hotels in each of these towns. Am I correct that there is a hotel for foreigners in Mt. Popa? From Mt. Popa, I am wondering where the next accommodation is for a cyclist on there way to Kalaw? There are two. But one is a really pricey resort, way out of our price range. The other is just OK. But it will run you $45. You can charge that when you are the only game in town. Warning. This is the only place in Myanmar where a hotel owner was dishonest with us. I paid for our room with two clean, crisp twenty dollar bills and one spotless five. Five minutes after we got into our room, he appeared and handed me my money back. One of the twenties had a tear in it. And the five had a corner that was nearly severed. He couldn’t accept this money. Well. It wasn’t my money. But there wasn’t much I could do. We didn’t have another hotel to choose from. I sucked it up and took the money and gave him clean money in exchange. Between Mt Popa and Kalaw we stayed in Meiktila where there is a foreigner-approved hotel, but it wasn’t our first choice. We tried to stay at a monastery in a small village about 25km outside of Meiktila because it’s a long haul and we wanted to see what would happen when we tried to stay some place without a guesthouse. The monks were all for us staying, but after more than an hour of smiling, juggling, sharing photos of home and family while a room was prepared for us, the headmaster arrived and he told us that for our safety and theirs, we could not stay. We explained that it was now too late in the day for us to pedal to the city before dark, He hailed a passing truck for us that took us to the Meiktila.We did hear reports from another traveler that they were successful staying in a monastery so if in need anywhere, give it a try. 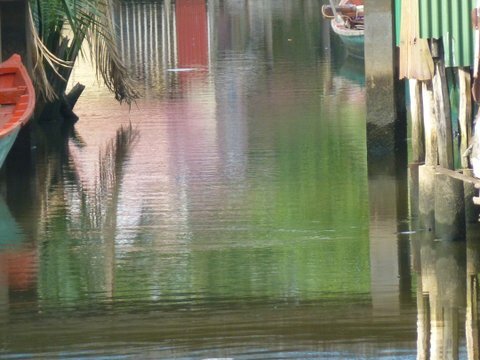 Do you have a recommended route from Inle lake to Mandalay. It sounds like you may have taken some back roads. From Inley Lake, take the road to Heho. Then ask the locals about the road to Pindaya. There is no sign. But it is a glorious road. One of the nicest we pedaled. We heard about it from our new cycling friends, Sergai and Adrienn, who are ending up an amazing bike journey. You can read about it over at Crazy Guy on a Bike. From Pindaya you take the road to Ywangan, and then on to Kyauske. We don’t have GPS, so we don’t have a detailed route to post. These roads are not “skinny tire touring bike” roads. They are “I wish I had shocks on my mountain bike” roads. But this section was our favorite of the trip. Is there a particular road map that you suggest? We carried both the Nelles and the International Travel Maps. Both were OK. At the time, it isn’t easy to get way off the traveled path due to the hotel restrictions and camping ban. But that may change soon. At the time we were there, no SIM card data plans for smartphones was available. When that opens up, Google maps might be helpful. It has been in other SE Asian countries. 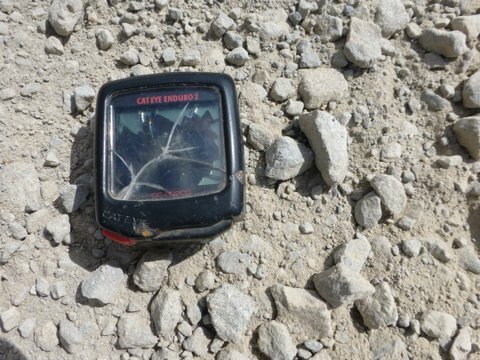 How easy is it to find food and water along route? Buying bottled water is easy. We carried a filter, and so filtered when we could to cut down on the plastic water bottle waste. Food is around. But not always plentiful. Good to keep reserves in the panniers. We both got sick in Myanmar. The hygiene around food prep and serving is pretty sketchy. If you come down with symptoms of giardia, the drug you can buy in Myanmar is Tinidazol. And it does the trick. Not available in the U.S. Be wary of advice you get at a pharmacy. The dosage they quoted was 1/6th of the recommended amount. Better to check a reliable internet source for dosages for meds. How often did you book hotels in advance? We booked a hotel in Mandalay (our arrival city) in advance. Also Yangon. But our travel agent messed up and we only had one night reserved, instead of the three we had requested. Our friends Sergai and Adrienn booked a room for us in Bagan a day before we arrived, and we phoned a hotel in Inley a couple of days in advance. Often a hotel you are leaving will call a hotel you are going to to make a reservation, but it can be hard to make that connection. If land line phones are not connecting, try asking someone to make the call using their cell phone. Much higher success rate and you pay them a small fee. A wonderful place to stay in Yangon is Bikeworld Explores Myanmar. We didn’t have the chance to meet Jeff, but his partner Soesoe will charm your bike socks off. She is a wealth of information and we felt at home the instant we arrived. Ah, the bounty of the sea! 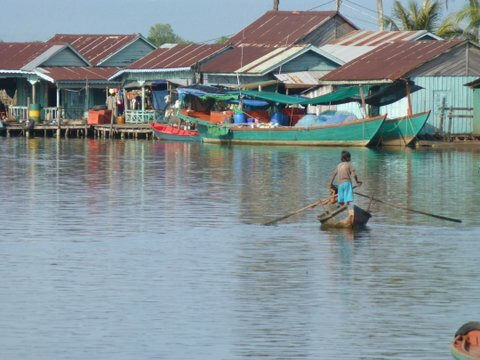 Bar-be-cues line the port-side street in Koh Kong, Cambodia come sunset, and fresh seafood is grilled to order. 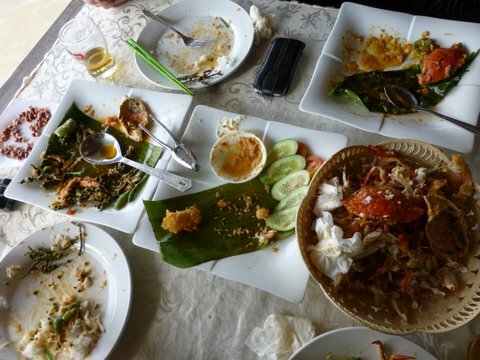 We scarfed down two plates of squid and a pile of clams before taking a photo. 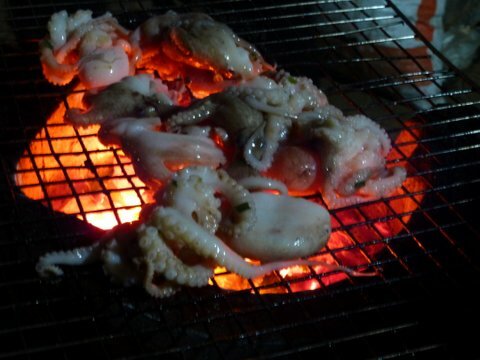 I capture a few octopus tossed on the grill for the next patron of one of the many food stalls. 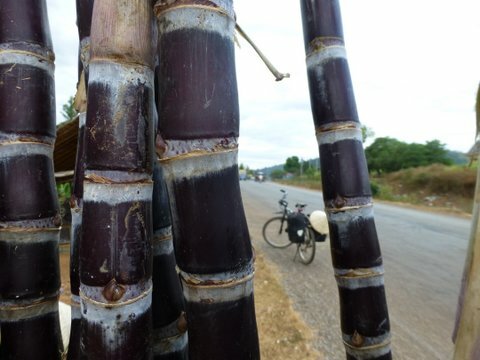 -k.
We’ve spent some long, hot days in the saddle on the south coast of Cambodia and a sugarcane stop refreshes like no other. A day without sugarcane is like a day without sunshine. 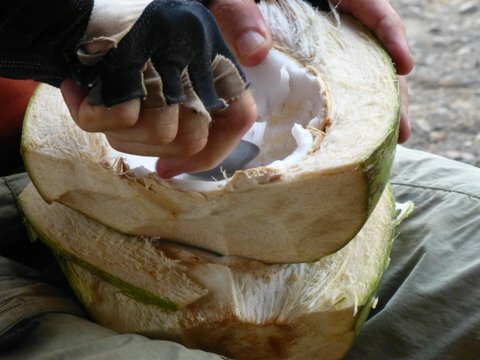 -k.
Coconut, the fuel for sweaty cyclists! The giant green orbs piled on the side of the road are a welcome sight in the heat of the day. We need fuel, and a fresh coconut water is packed with electrolytes and the meat is pure, healthy fats. Beats Gatorade and Snickers by a long shot. 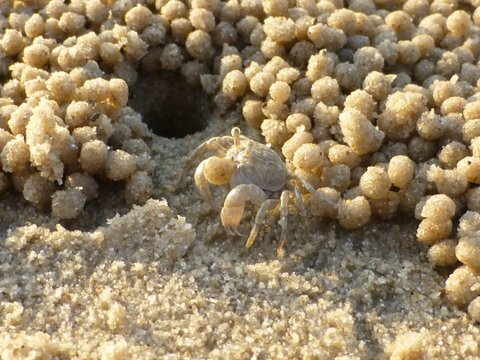 -k.
Rarely do we spend a day lounging at the beach, but we made a day of it at Victory Beach in Sihanoukville, Cambodia. 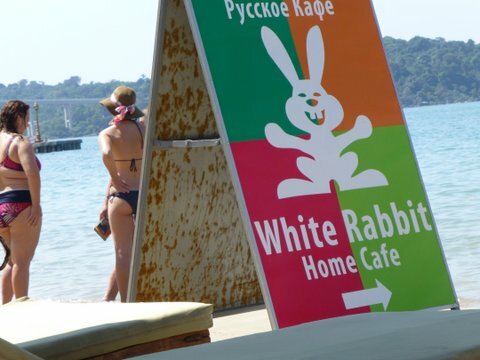 It’s known as a “Russian” and “family-friendly” beach and both descriptions turned out to be true. It was a relaxing way to finish a book and start another … while taking an occasional dip in the ocean to cool and refresh. 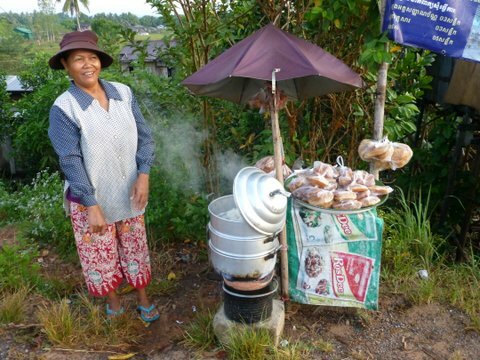 -k.
Until Kampot, Cambodia, I had never given pepper much thought. It is a staple on most tables at home in America, but I had no idea how fruity and fiery freshly dried pepper can be. The aroma is intoxicating! Rather like smelling tobacco leaves drying, there is a richer level of aroma than the familiar smell. 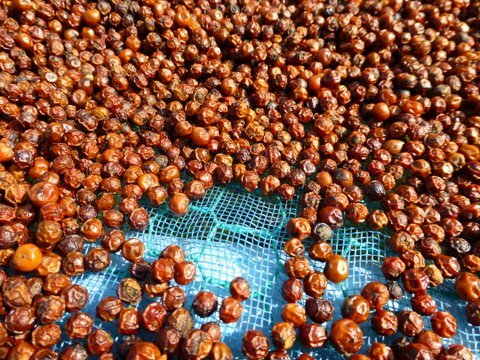 Kampot pepper received a Geographic Indication, giving it a protected status similar to Champagne or Feta cheese. And so it should be. -k.
Good food is a glorious gift I always appreciate. In fact, discovering good food prepared well is one of my main motivations for travel. 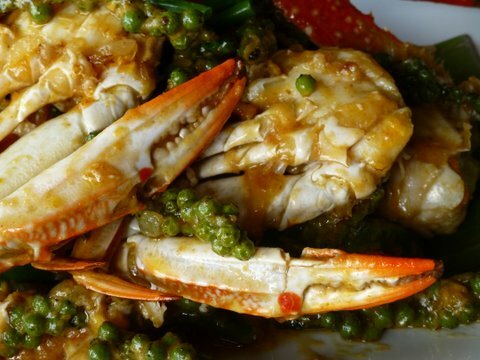 The crab with Kampot green peppercorns at the Kimly crab shack in Kep, Cambodia, was gift worthy of Christmas day. We shared the meal with fellow-cyclist and food-lover, Tibor Barna, from Hungary. Our animated conversation turned to silent reverence as we gave this gift our full attention. -k.